one of the unexpectedly great parts of working at the times when i did was getting to work with sooo many talented writers and editors. one of the coolest was the very laid back dean kuipers, who i knew had previously worked at spin, my favorite magazine, but it wasn’t until tonight that i learned that he worked at Raygun, which for a while was the coolest mag in the world. My heart broke. He worried that his surreal vision was too obscure, his many personae too fragmented. I reassured him that when your art is one of the root references of the present, you are always relevant. “I wonder,” he said, unconvinced. had real self doubts about the one thing he had been doing beautifully his whole life. im so grateful dean wrote about this today. I read your post about remembering David Bowie “singing in a sarcophagus“. I cannot find this video anywhere. No one other than you, me and one other person ever remember seeing this. I wonder if we all saw it “live” but the clip was cut out of syndication and just never shown again. Anyhow, I even posted a youtube video asking for help in finding this. It actually frightened me as a kid. I am 40 now and just would like to see it again. 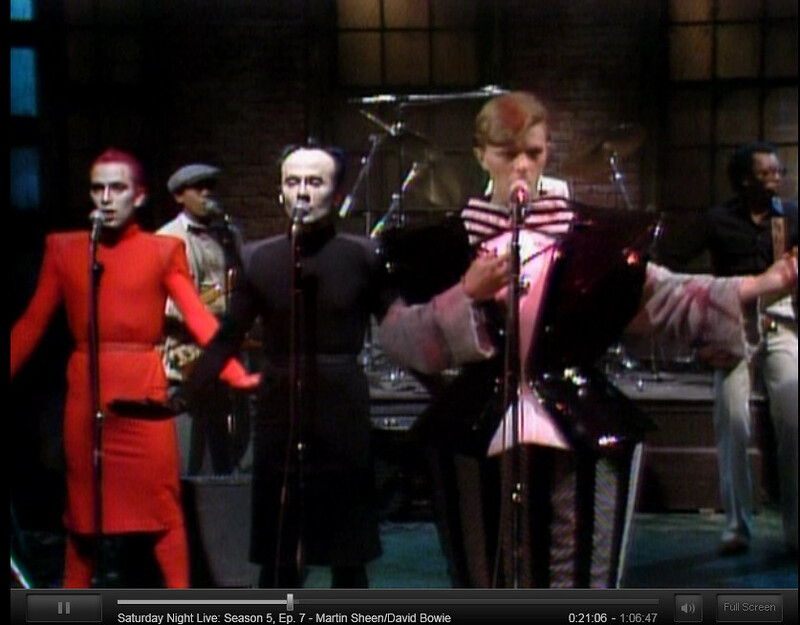 You can see Bowie do “The Man Who Sold the World” beginning at the 20 minute mark on the Season 5, episode 7 of SNL. The episode was hosted by Martin Sheen. Sheen was hyping a little art house film called Apocalypse Now. Good performances by Bill Murray, Jane Curtain, and Lorraine Newman. Bowie did three songs that night. The first one we have covered, the second tune Bowie performs in a a-line skirt, and the final song appeared to be some green screen trickery predating the Gorillaz by decades. By the way, every episode of Saturday Night Live is now available on Netflix instant streaming thanks to Obama and generous subscribers like you.